None dare call this pretty. FN57 pistol is second only to High Point and some WW2 Japanese designs in full-out industrial ugliness. However, it is accurate, holds a useful number of rounds and, once sound-suppressed, comfortable to fire. This one is a part of the beauty and the beast pairing, with the beauty being its owner, one of my models. This entry was posted in pistol, self-defense, weapon and tagged 5.7x28, effective, FN, ugly. Bookmark the permalink. 14 Responses to None dare call this pretty. and it costs about 2-3x compared imho to other caliber pistols, even by the same maker. i don’t know if it’s just economoy of scale on the pricing? people don’t buy as many 5.7×28 guns in any form factor as opposed to 9mm, which they makes MILLIONS of. still want one 🙂 esp with AR 5.7 pairings. it’s a “fugly” i can love. I don’t think it looks that bad. If you want homely looking gun, I submit the Glock. the steyr pistols are very similar in look, and ergonomic as all get out. That’s not a bad looking gun. Sure, it isn’t attractive in the same way as a Colt SAA or a S&W Schofield, but it looks darned comfortable. a S&W 629 Mountain Gun is … well, pretty swell. all metal deeply blued, or phoshated, or stainless guns are very attractive to me, but a well treated polymer job can be nice. wood is okay. the PMR-30 isn’t going to win awards, but i lurve it. 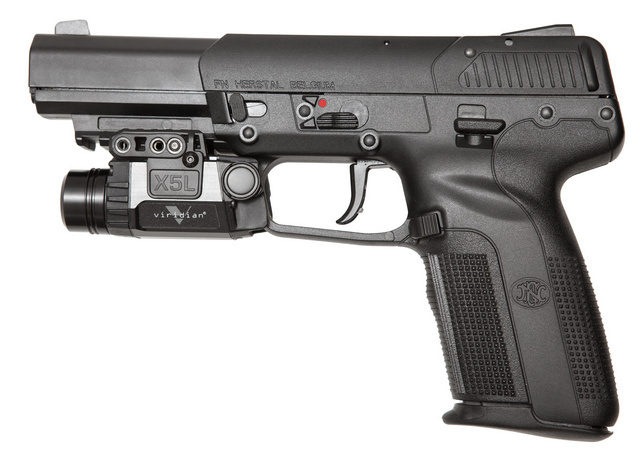 The FN “Five-seveN” is meant to be a service weapon. And service weapons aren’t meant to be pretty, they are meant to be intimidating. It Is Written:”Pretty is as pretty does”. Is it reliable? Accurate? Comfortable to carry & shoot? My Glocks & AKs are ugly but they bloody-well work. Ok, so let’s see the beauty. True, I dare not call it pretty, but nor do I think it ugly. I also don’t think it looks intimidating, the look is too plasti-soft for that. I’ve always thought it had a certain ‘Lego Chic’ vibe to it. It’s part of the appeal really. Funny I should read this thread after just coming over from WRSA. Over there, a post was compiled from the latest overt moves toward tyranny by our elected overseers and appointed dimwits. It is not hard to see the trend that is born from all of this, without even visiting the linked articles…how ugly will this HIGHLY concealable handgun be, if one day you are forced to use it on an armoured assailant, whether he be a garden-variety thug, or one wearing jackboots? It is a tool, and it should be designed to work first, and above all else. I like functional designs. I don’t like all the little frills. If it’s well manufactured (and if it’s an FN it is) then I would definitely call it pretty. Well, more like beautiful. It has the beauty of functionality and reliability. Not as bad as a Glock. BTW, is it true that polymer frames are more easy to make durable than metallic ones, due to them being less susceptible to cracking?